The wettest year in recent history is bringing relief to California growers. The relief may be short-lived, however, unless state water officials make permanent changes in water management and address the supply shortfall during drought years. A new executive order has been issued by the state to improve conservation measures and water-management procedures. Figure 1. 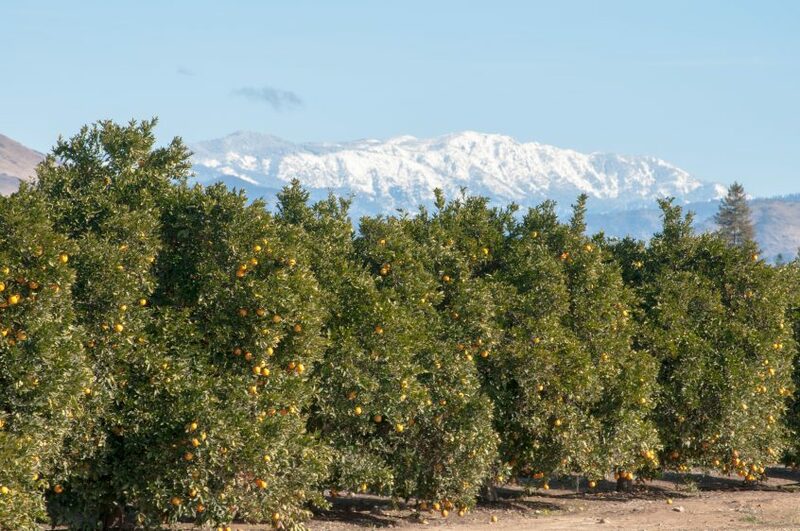 Much of California’s irrigation water arrives as snow in the Sierra Nevada mountains in the central and northern part of the state. The short-term outlook is good. Yet water allocations still remain up in the air for 2017, even as the wettest winter in years plays out with surprising rainfall amounts and amazing Sierra Nevada snowpack (Figure 1) numbers. Figures released in late January showed the state’s reservoirs at 107 percent of average. The snowpack is about 200 percent of normal, as of February 1; it would be an average year if there were no additional snow at all. But with at least two months remaining in the wet season, it is a banner year for water. The snowpack could reach 250 percent of normal, which should allow plentiful irrigation throughout the year. Growers are hopeful for increased allocations while state officials remain cautious. The order has new requirements for both urban and agricultural water users. 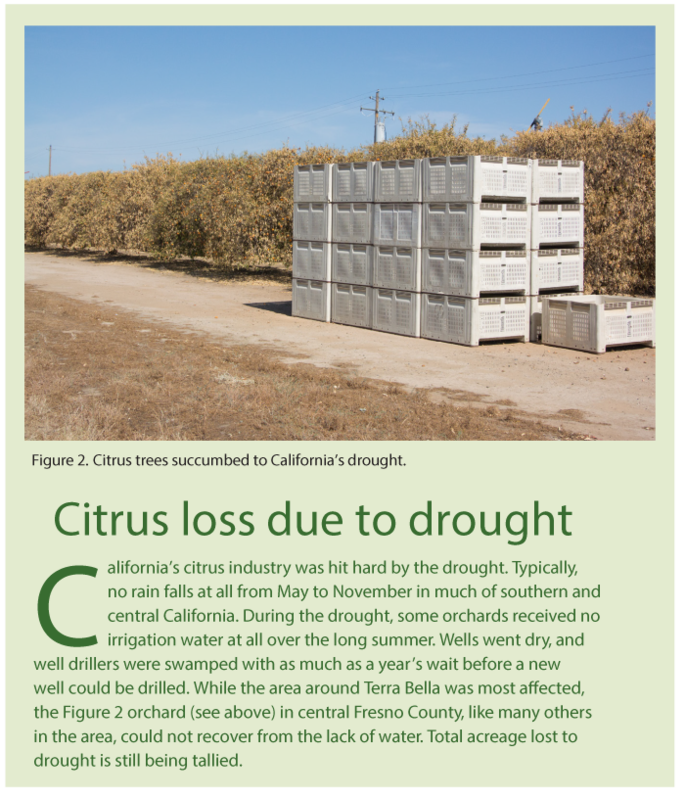 The trade group California Citrus Mutual (CCM) is holding a series of informational presentations about the requirements for agriculture, which began with its Citrus Showcase held in March in Visalia. CCM is a non-profit trade association that advocates for growers on economic, regulatory and political issues. There are substantial differences between requirements for urban and agricultural water users. For urban water users, the new standards will take into account the unique climatic, demographic and land-use characteristics of the specific service area rather than applying an arbitrary percentage of water-use reduction. While taking those factors into account, urban water users will be required to meet new standards in water-use reductions. These new standards will encourage conservation measures such as conversion to California-friendly landscapes, replacement of inefficient fixtures and appliances, and reductions in system leaks. Under the plan, agricultural water suppliers will be required to meet new standards. An agricultural water supplier is defined as an entity that provides water to 10,000 irrigated acres or more of land. These entities will need to prepare, adopt and submit plans by April 1, 2021, and every five years thereafter. They would also be required to submit an annual report to the Department of Water Resources by April 1 of each year that documents water budget inflow and outflow components in the water budget for the preceding water year. They will need to develop an annual water budget for their agricultural water service area, quantify measures to increase water-use efficiency and develop an adequate drought plan for periods of limited supply. CCM is worried that these and other new regulations will place a significant burden on California citrus growers. Annual rainfall is one of two sources of water in California. The other is pumped groundwater, which is used by a large number of growers. With the extensive water allocation cuts of the last few years, the groundwater aquifers are now being drained. To help manage those diminishing supplies, Gov. Brown signed into law the Sustainable Groundwater Management Act in 2014. According to Bob Blakely, vice president of CCM, the group is closely monitoring the implementation of this act to ensure water rights are maintained and regulatory cost burdens are minimal. Len Wilcox is a freelance writer in Sanger, California.